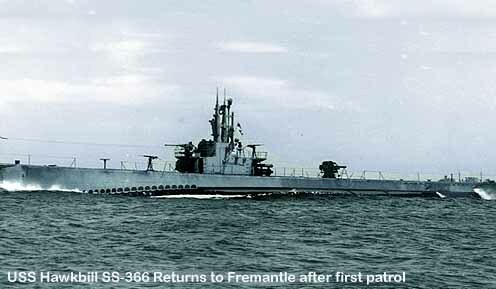 Hawkbill as she was passing Rottnest Light at the entrance to Fremantle, Western Australia on the final day of her first War Patrol October 10, 1944. The history of World War II is my passion because this is a war we had to win. Had we failed to win it, America would not be the same country. It is men such as those who served on Hawkbill that made a free America possible. To them and their memory, I pledge every effort that they be remembered. It is seldom a Webmaster is honored to this extent. I want to share with you the following letter I received from one of the officers of the USS Hawkbill SS-366. indulgence. And I find myself positively overwhelmed. the role she played in the grand scheme of things so long ago. The Greatest Generation, you have made them plank owners. All material copyrighted all rights reerved.